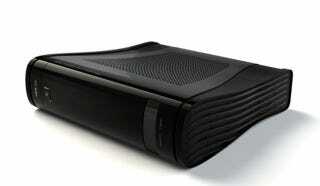 Let the Xbox 720 Concepts Begin! Now that rumours about the next Xbox console are flying thick and fast, those with an eye towards the future and a hand on their mouse are dreaming up concepts of what the next machine will look like. Here's the first credible one I've seen in the wake of the recent rumours, which is the work of Yanko Design's Joseph Dumary. His "Xbox Prestige" envisages a case design similar to that of the current console, only this one includes a 2TB hard drive, 8-core processor and, perhaps most importantly, packs Kinect right into the main package, the lens peering out at you from where the USB ports are on the older Xbox 360.